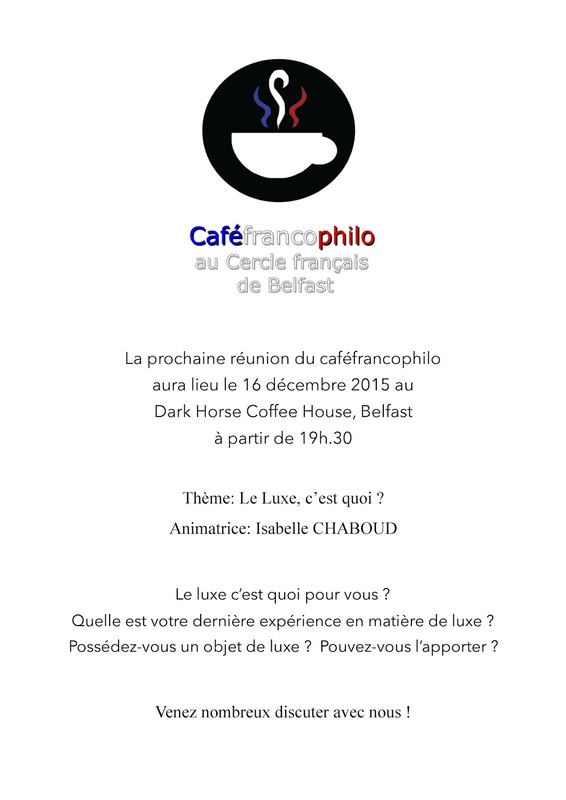 Our second caféfrancophilo of this season was a very successful event. This time proceedings were animated by Isabelle CHABOUD who addressed us on the theme of luxury: Le Luxe, c'est quoi ? She started the evening by showing us a foulard given to her as a gift by her grandfather on her 18th birthday and treasured safely in its distinctive orange cardboard box. This immediately identified it as a Hermès product and led us into a brief presentation on the luxury brand, exploring its early beginnings in quality leather goods associated with l'équitation - horse riding. Isabelle's presentation prompted a series of questions on the nature of luxury and participants felt that rather than cost, luxury's characteristics had to do with exclusivité and rarité. Members had strong ideas and were very forthcoming in their views. It was also very pleasing to see that some had brought along items that they considered suited our theme. Bravo ! Leo explained that L’idee de luxe, patrimoine et durabilité were important to them. He presented some beautiful items which participants were able to view at close quarters and the quality and craftwork of which still shone through their protective covers. Leo reinforcing a link with France pointed out that Maria was invitée exceptionelle at this year's Festival du Lin et de l'Aiguille 2015. The festival takes place in July each year in Normandy. Here is a link to the upcoming 2016 festival, now in its 25th year. Our animatrice, Isabelle, moved busily among her audience seeking views and opinions, questioning our own interpretations of luxury and what it signified for us. She facilitated a sustained exchange of views and suggestions and then brought us to a conclusion in a most interesting way, letting an online video explain a further initiative from the house of Hermès - Le petit h.
Here is a link to the video: It's the first in a series of five short films, each of a few minutes duration. It is an interesting watch as it shows how nothing is discarded at the famous luxury house and how even off-cuts can be reused in creative ways. Our evening concluded with grateful thanks to Isabelle who it must be said brought her own unique brand of quality to the proceedings. Le Luxe, c'est quoi ? Louis Boyle, veteran of several trips along the world renowned pilgrimage route through France and on to Santiago in Spain, was the speaker for our December talk. We learned early on that others too had walked various stages and there was an interesting exchange of tips and suggestions for those who might be considering following in their footsteps. Louis began with a brief history of the pilgrimage route and then took us to St Jean Pied de Port on the French side of the Pyrenees. Using a series of photos he conveyed both the sense of challenge and the camaraderie experienced by the walkers. In the photos it was clear that Louis was travelling light while others seemed to be very heavily burdened. He explained the importance of documentation for those taking part as well as the need to be organised. Finding someplace to stay was a priority and Louis noted that some of his French fellow-travellers booked ahead. He on the other hand found that if he set out early enough in the morning, around 7am, he could arrive in time for lunch, find lodgings, get laundry done and settle in for the evening in time for curfew at 10pm. He had some amusing albergue anecdotes of staying in the pilgrim only hostels. Louis displayed items associated with his camino walk. He drew particular attention to his camino passport, needed for food and lodging en route, his compostella - authentication that he had completed the journey to Santiago and the iconic scallop shell worn as a badge by pilgrims and named after Saint Iago/James/Jacques. Louis told us that he's off again next year to follow a feeder route starting at the medieval town of Le-Puy-En-Velay in the Auvergne. We'll follow his journey with interest. Thème: Le Luxe, c'est quoi? their ideas on what they feel constitutes luxury. from 17.30 until 20.00 in Upstairs Madden's, Berry St, Belfast. you can put what you have learned into practice. good time, attendance will be limited to those who register in advance. Watch out for an email with full details arriving in your Inbox soon. 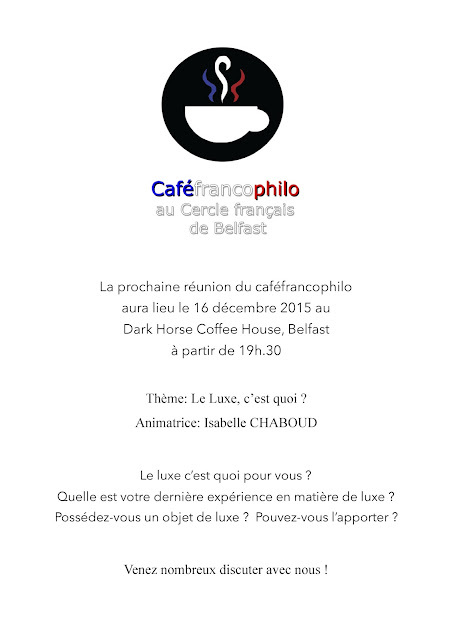 Looking forward to seeing you in the Dark Horse Café in December.